As I shared a few weeks ago in my post The Ultimate Tailwind Review: How to Automate Your Pinterest Game, I’m a huge fan of Tailwind. It helps me pin consistently throughout the day, at ideal times for my audience, all on an automated, scheduled basis. I typically pin 60-70 pins per day, though there’s not a real science to it. Some people pin way more, and some pin much less. But, for me, I’ve found this to be a good amount. The thing is, it can be hard to find that much content to pin! Because of that, I thought I’d write a post about how to fill your Tailwind schedule. Here are 6 simple ways I do that. #1. Pin multiple pins for every blog post. This is probably the single best way to not only fill your schedule, but grow your traffic from Pinterest. For each blog post I publish, I pin 5 to 12 different pins. These are different graphics that have different copy, fonts, and colours, all promoting the same post. I pin them to different boards, and then schedule them out to different Board Lists so that they get shared to all of my (relevant!) personal and group boards. This may seem time-intensive, but there are ways to really speed up the process. If you create a few different pin layouts in Canva, you can reuse them for each post. For example, using a combination of Canva templates and my own designs, I’ve developed about 12 different pin templates that I can use. When I create a new blog post, I just copy those templates and then update the image and text accordingly. This means I can create a new pin in under a minute! #2. Pin additional pins for old blog posts. If you’ve only pinned a few pins from old posts, go back and create new pins. This is a great way to get more mileage out of your content and refresh it a little! Plus, it helps get your (already published) posts back on Pinterest in a new and relevant way. Like in the first step, go to your pin templates and create some new pins for your old posts. You can experiment with different headlines, fonts, colours, and images. Overwhelmed at the thought of conquering this step? Don’t be! Choose even one old post per week and create a new pin for it. Soon enough, you’ll get into a good routine of creating new pins that it will be quick and easy to do. #3. Re-schedule Pins from the Pin Inspector tool. From there, you can easily click “Re-Schedule this Pin” and choose which board you’d like to share it to. By default, it will select the board it was pinned to that yielded that high re-pin number. This is a good way to re-pin content to a board where it’s done well. If you’d like to more easily share it to multiple boards (or an entire Board List), just click on the pin image. This will open the pin in Pinterest, and from there you can schedule it as you would normally. That’s a better approach if you’re trying to schedule the pin to more places, more quickly. #4. Re-schedule your top pins. One of my favourite ways to add to my Tailwind schedule is to re-schedule my top performing pins. There are a few ways to do this. My favourite two are from Google Analytics and from Pinterest itself. 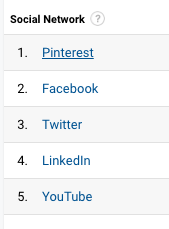 To find my top pins in Google Analytics, I like to look at the blog posts that are doing best on Pinterest and then schedule the top pin for each of them. That way, I’m not flooding Pinterest again with a bunch of pins from the same post. First, choose the time frame you’d like to see. The last 30 days may be a good place to start. 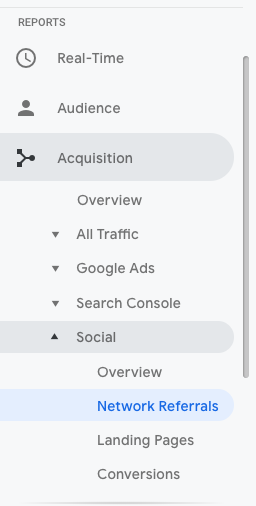 You can do this in the top right corner of Google Analytics. On the left hand side under Reports, navigate to Acquisition, then Social, then Network Referrals. Choose Pinterest as the Social Network. This will show you the traffic you received from Pinterest during the time period you suggested. 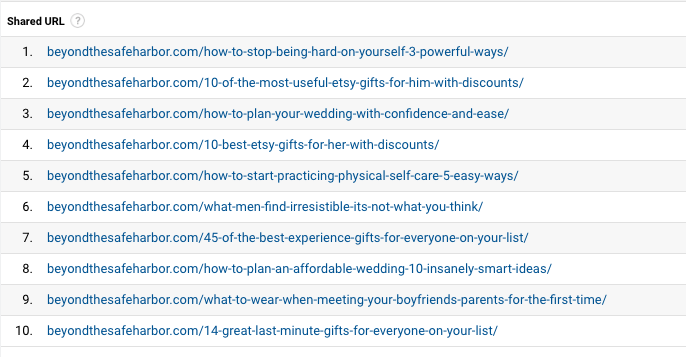 You will then see your top 10 blog posts in terms of Pinterest traffic. Work your way down the list, clicking on one post at a time to see the top performing pins. I’d recommend copy-and-pasting the pin URL for the top pin for each, opening it in a new tab, and then scheduling it from there. Here are my top 10 posts in Pinterest traffic from the last 30 days. 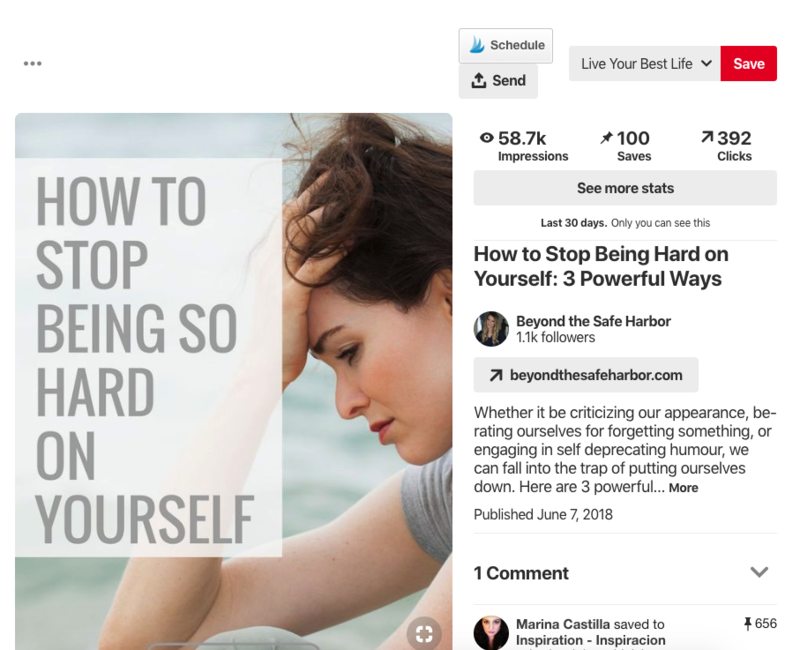 If I click on the first one, I’m taken to the top pins driving traffic to my post How to Stop Being Hard on Yourself: 3 Powerful Ways (and if you’re interested, you can read that post here!). You’ll notice that some have the URL for a complete pin, and others just show up as pinterest.ca which isn’t helpful! Copy the URL for the top-performing pin and paste it in a new tab. This will open the pin, which you can then schedule to whichever boards you wish. You can then repeat this exercise with more of your top posts. Another way to find top-performing pins is to go to your Pinterest Analytics. This won’t give you nearly as much data, but it’s good if you need to schedule some content in a pinch. 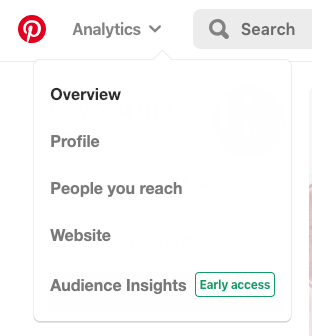 Note that in order to access Pinterest Analytics, I believe you need a Pinterest Business Account. Navigate to Pinterest Analytics (top left corner once you’re logged in) and click Overview from the drop down. 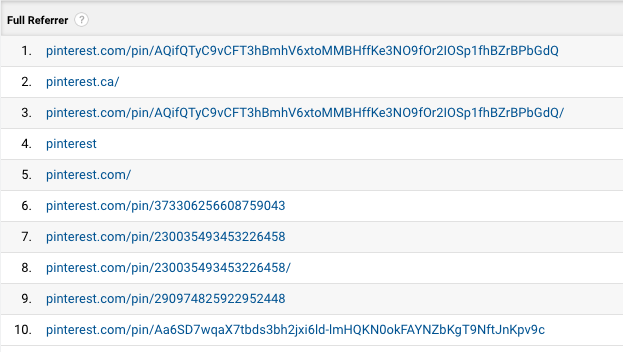 If you scroll down, you’ll see your top pin impressions from the last 30 days. You can then click on any of these pins to open them in a new tab and schedule them from there. #5. Schedule pins from Group Boards. If you’re part of any Group Boards on Pinterest, you can browse them for content to Schedule. The easiest way is to go to Group Boards with a specific topic so that you can schedule a bunch of pins from that board to the same Personal Board. Using the Tailwind Extension for Chrome (or whatever browse you use), you can select a bunch of pins on the page and schedule them all to the same personal board in just a few clicks. Looking to find group boards to join? I’d recommend joining some Facebook groups to find them. Search “Pinterest group boards” and then request to join some of those groups. In them, board owners typically post their group boards and you can ask to be added. Alternatively, you can use a tool like Pin Groupie. It lets you search Group Boards and you can then see if any are accepting new contributors and then request to join. #6. Schedule pins from Tailwind Tribes. As I mentioned in my Tailwind Review, Tailwind Tribes are like group boards, but are private to Tailwind. They are a great place to not only share your own content, but to find others’ content to schedule to your Tailwind schedule. If you aren’t part of any Tribes, you can find some through Facebook groups. Like the above, search “Tailwind Tribes” on Facebook and find some groups where Tribe owners are looking for members. You can then ask to be added. Once you’re part of tribes, follow their requirements (for example, re-pinning the same number of pins you add) and look for relevant content to add to your personal boards. 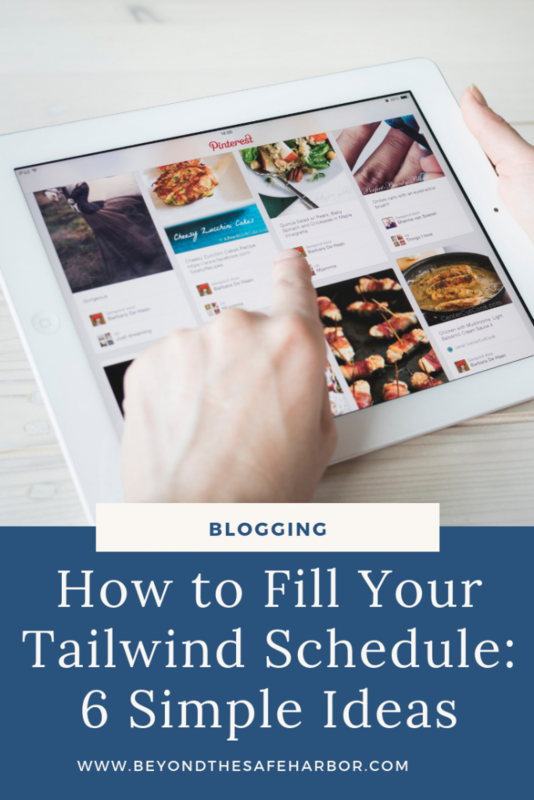 There you go – 6 ways to fill your Tailwind schedule and have relevant content being automatically pinned on the regular. Have you found additional ways to add to your queue? I’d love to hear it – let us know in the Comments section below.